Knowing what kinds of plants and crops will grow best in your soil. Finding the right areas for large construction projects. Determining where pipelines and other underground structures are best placed. And that’s just the beginning. The soil on your land is the heart and soul of your operation and it’s something that you’ll likely be dealing with on a daily basis. 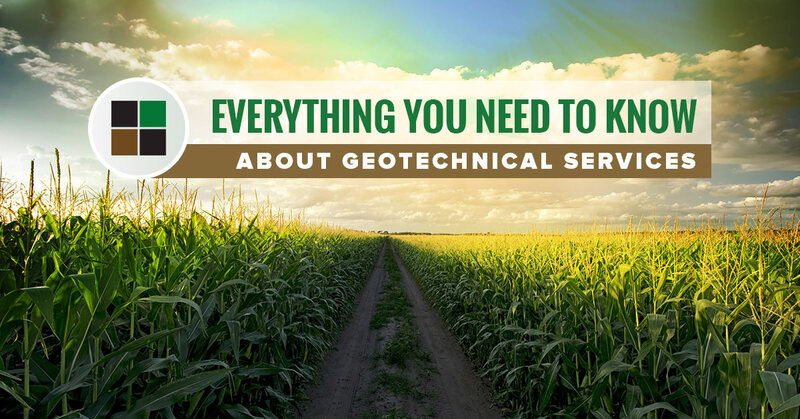 Geotechnical services can help you learn all you need to know about that soil. Once you are armed with the information, you’ll be able to make the best choices for your ag operation. Have questions about how our geotechnical services work? Our agricultural development team in Greeley has put together this guide to help you find the answers that you need. Trenching. This involves digging a trench over a distance and examining how the soil changes along the way. Test pits. This method is true to its name. We dig a small pit to see how the soil reacts as we do. Boring. This is anything but boring! This involves taking a soil sample out of the ground and sending it for testing, trying to preserve the soil as it would be in the ground. In-Situ testing. This just means testing on your site instead of taking a soil sample away with us. These tests usually involve drilling or penetration tests. The list can go on and on. If you need to know it about your soil, we have a test that can give you the answers that you need. For instance, if you need to build a road on your ag property, we can help you determine the load limit, how much fill material you’ll need, how compact your soil needs to be, and the strength of your road design. If you are having trouble with your crops, we can help you discover if your pH or sulfate levels are too high or low and affecting the growth of your crops. Are you ready to get the information that you need about your soil? Talk to our agricultural development team in Greeley about our geotechnical services. Give us a call or contact us through our website for more information today.